We have seen that the material in the Travel Narrative consists primarily of Jesus' giving instruction to his disciples and to others. There is very little narrative here. This week's Gospel text marks an exception to this rule. 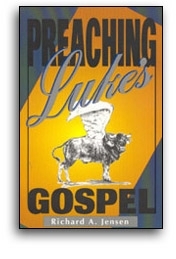 Luke tells us the story of a woman with a spirit that had crippled her for eighteen years. Jesus saw the woman and called her to stand straight and be healed. Jesus did this act of healing even though such "work" was forbidden on the Sabbath.